I am briefly shedding my blogfur to discuss Sandy Relief Beer, a collaborative effort by eight Long Island breweries to raise proceeds for victims of Hurricane Sandy (via Long Island Cares, Inc.) and Barrier Brewing Company. Sandy Relief Beer was initially a video project by Matt Furman and me, documenting the creation of an all-Long Island beer for Long Island Craft Beer Week 2013. After eight breweries confirmed participation and Blue Point Brewing Company offered its facility as host, however, Hurricane Sandy devastated Long Island and destroyed Barrier Brewing Company. The Oceanside-based brewery, owned by Evan Klein and Craig Frymark, lost equipment, momentum (the duo expanded to a 4600-square-foot facility in May), and the ability to brew. The aforementioned assemblage gathered at Blue Point Brewing Company on December 04 and brewed Surge Protector IPA. Each brewery donated an ingredient for the liquid (Clare Rose Inc. will handle distribution), exhibiting the solidarity of Long Island’s beer community. 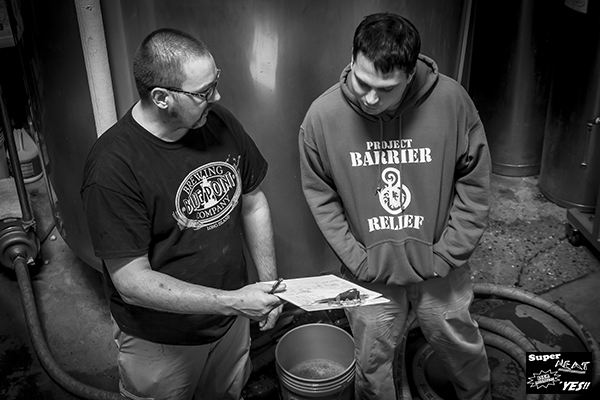 Sandy Relief Beer is fueled by compassion, comradery, and community. This beer is for you, Long Island.